When you look at rhe screen shot you assume that it's one room in a house. WRONG. 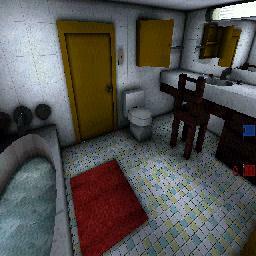 this map is like the standard rocket arena map, exept thats its in a bathroom. for example, the sink tap is twice/three times the height of you. This map is huge, but seems smaller because you can see across to the other base. This allows fun sniping, but no other real forms of shoting them as the weapon takes too long to get there. It's actualy a fun map! you use a portal to get to the ground, and then another portal on the other side to get up to the bath. The bases aren't the same, the blues flag is next to the sink, (large table area) and the red is next to a barth (small fighting area, easeir to defend). I really enjoyed this map, it's worth the download.